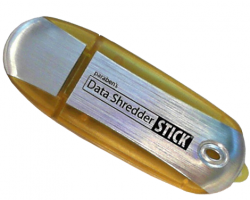 Paraben's Data Shredder Stick is a thumb drive device that acts as a portable digital document shredder. When files are deleted on your computer, they aren't really gone, even if you empty your recycle bin. Files can be recovered using data recovery tools until they are overwritten by new data. The Data Shredder Stick allows you to permanently shred individual files and folders or shred all deleted data from an entire drive. This tool is easy to use. Simply drag-and-drop any file or folder into the app and confirm you want the data to be obliterated. You can also select an entire drive and the Data Shredder Stick will overwrite every bit of unallocated space where deleted data resides so nothing can be recovered. Every office has a document shredder and every computer user should have a digital document shredder. The Data Shredder Stick is your personal and portable digital file shredder. Make sure the bad guys can't get access to your sensitive documents by securely shredding files with personal information.